"This is what the sport needs to be every single race and this is why I race, what got me into racing." So noted the victor Lewis Hamilton afterwards. It was hard to argue. Hard pushing of F1 cars by two world-class drivers contesting the win - one of whom sounded breathless on the radio throughout such were his exertions. Two fine on track overtakes for the lead. An intriguing, varied strategic battle too, that only was resolved late. 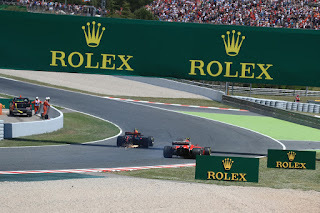 The Barcelona circuit - associated usually with all things dull - must be losing its edge. Or perhaps F1 is gaining one. 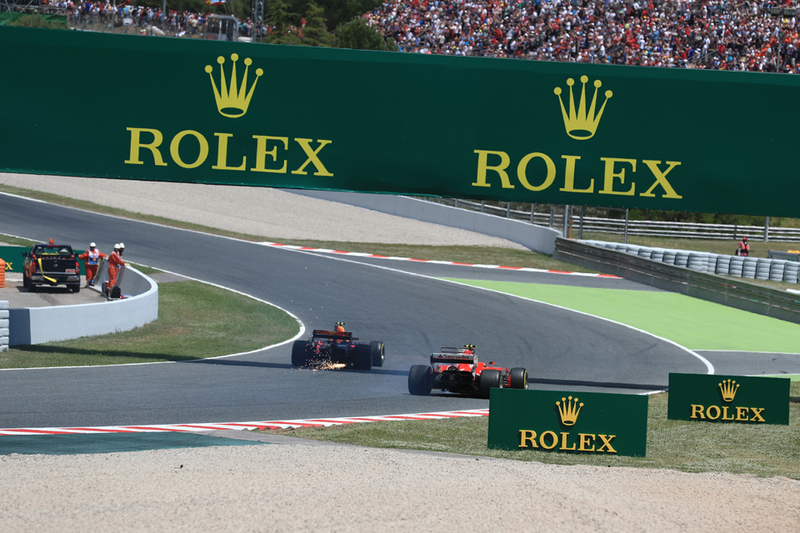 F1 returned to fundamentals for the Spanish Grand Prix today, not least with its fundamental for 2017 tete-a-tete at the front between Sebastian Vettel and the afore mentioned Hamilton. For most of the way the rest were distant things that made noise. And for much of the way the race looked Seb's to lose. Once again he got the better start and scampered off in a way straight from his Red Bull pomp - 2.2 seconds clear after one lap. Lewis indeed in the opening stint admitted on his radio that it was "not easy to keep up", though he at least managed to hold the gap at something like 2.5 for a while, and then started to chip at it not long before the first stops. It was therein that the day changed however. Vettel and Ferrari seized the initiative by pitting first, on lap 15, but rather than just follow them in Lewis and Mercedes pressed on, and didn't pit until lap 22. And as if to get all of the oddities done all at once Lewis was switched to the medium tyre, reckoned to be around two seconds a lap slower than the de rigueur soft compound and therefore all sought to minimise their number of laps on it. But it was clear that Merc was seeking an offset to attack on the soft tyres later (when Seb presumably would be on the mediums himself). In any case just doing what Ferrari did would guarantee second place at most. 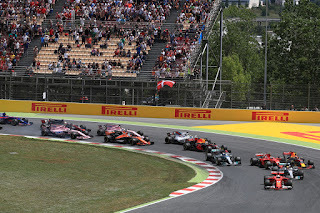 Lewis emerged eight seconds shy of Seb, and then the next stage of the Merc master plan became apparent as the other silver car, pilotted by Valtteri Bottas, which hadn't pitted, held Seb up for a few laps. Seb got by eventually with a Nigel Mansell on Nelson Piquet-esque dummy into turn one, adding two wheels on the grass in something of a flourish. But still it all allowed Lewis to close by around four seconds. "With Valtteri I was catching him and I knew they wouldn't pit him," said Seb later. "He was all over the place with the tyres, so they used him a bit to block me. "I thought I had to find a way even if it was on the grass. It was really close, I faked it on the inside, then went back on the outside and inside again, but nearly lost the car as I had DRS open - but it worked. "I looked down and I had lost an awful lot of time." Seb then stretched clear, sometimes taking a second or more out of the chasing Lewis on a tour, sometimes only taking a couple of tenths. It was a crucial stage of the race and all seemed in the balance, albeit with Lewis at least still having on track overtaking to do if he wanted to win. But then the day not so much shifted again but tilted a little. Stoffel Vandoorne - as usual circulating slowly in his recalcitrant McLaren Honda - removed himself from proceedings by running into the side of Felipe Massa, the Belgian apparently not paying attention (odd as he arrived in F1 with a Prost-like reputation for avoiding collisions). 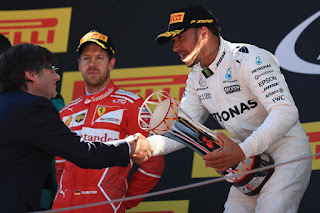 It was an odd choice by the team as it definitely cost Lewis time relative to stopping the lap before, something ceded by Merc boss Toto Wolff later. "The optimum would have been to make it one lap earlier," he admitted, "that would have given us more of a gap". But still it gained him some time back on Seb, which showed itself gaudily a lap later when Seb himself pitted for mediums, to 'cover off' his pursuer. But as the Ferrari rejoined the track Lewis was alongside. Literally. 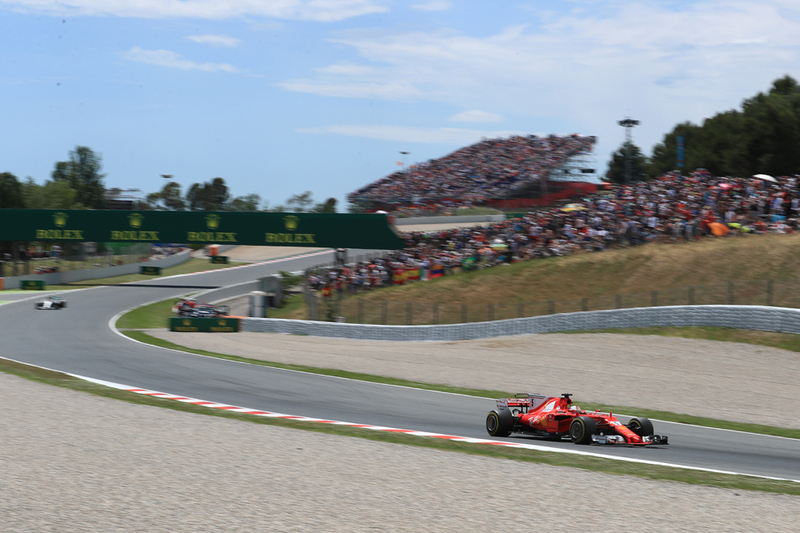 And was given no room, running off track at turn one and Seb retained the lead. The Englishman grumbled on the radio, calling the move "dangerous", though in the cold light of day was more magnanimous. "I was alongside, so it was definitely close, but again that's how racing should be and I loved it, I wouldn't change it for the world," Lewis said. Seb took up the subject too. "I was a bit surprised when he came out [of the pits], it was so close, I tried to brake as late as possible in turn one and locked up. "I don't know if we touched, I managed to stay ahead, so it was really close, then I was doing all I could to stay in front." Indeed. Lewis on the quicker rubber was all over Seb like a bad suit, trying for a number of laps in succession to pass at turn one. And on his fifth try he managed it, sweeping DRS-assisted around the outside. "I was a bit lucky [before] as there was a car in front giving me a tow, then I was alone and he flew past," added Seb. From then on it was a matter of whether Lewis's softs could hold on for the rather mammoth final stint, which they did. Ferrari spoke on the radio of a 'plan C', which presumably was pitting Seb for a third time to attack on new softs, but it mattered not as Lewis usually had enough of a gap to cover it off. He then set fastest lap with two to go as if to underline it was his day. His deficit to Seb in the table is now six. "The last stint, 25 laps, when they told me they [the tyres] had to do that I didn't think... I thought at the end of the stint he would come back but we managed it," Lewis concluded. "It was just the rawest fight I can remember having for some time, which I loved. "To have those close battles with him, a four-time champion, is awesome. "[It's] one of the hardest races. Physically, I lost probably nearly two kilos just in that race. 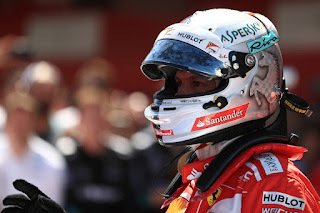 It's draining, cars are fast, to keep up with him [Vettel], he drove fantastically well and it's a real privilege." Vettel meanwhile was gracious but also frustrated. "It was a shame, we tried to stay in the race, well done to him, we did everything we could," he conceded. "I am not happy, it [the win] was there." 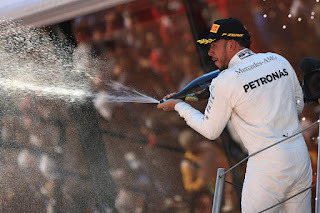 The thought occurs that Merc's strategy decisions haven't always been strong, even in the recent years that it's dominated. Not many would have backed the squad to prevail after turn one. Yet its strategy today was masterful. As was the man that converted it. "Lewis saved the race with an incredible drive," noted the as-ever bang on the money Niki Lauda. "The strategy was great, but it was the driver who won it." The next guy home was Daniel Ricciardo, although any joy at this might be tempered by that he got there some 75.8 seconds after the victor. Even after the Red Bull's clear improvement it's clear there is much work to be done. He was the only other on the lead lap, indeed was the only one of the 'big six' to make it to the end. 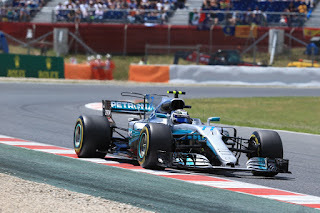 Bottas dropped out at two-thirds' distance with technical troubles (a big blow to what had looked a burgeoning championship challenge) while Max Verstappen and Kimi Raikkonen were removed on lap one, after Bottas nudged Kimi into Max, giving the latter two irreparable suspension damage. 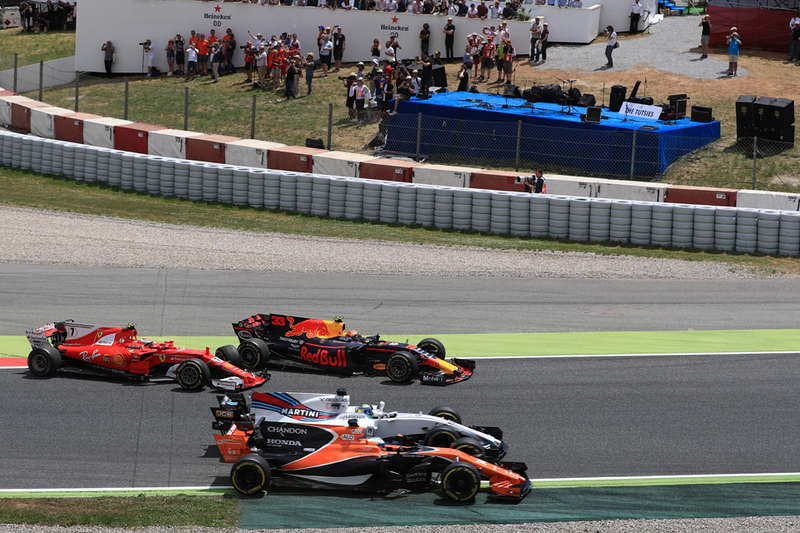 Yet today reminded us of the F1 truism: that it only takes two cars to make a race. The first lap chaos and mid-race Virtual Safety Car, as well as Bottas's retirement, did plenty to shuffle the midfield pack as well as give them an opportunity to bag big points. And - whadayaknow - it was the perennial Force India squad that made the most of it, getting P4 and P5 with Sergio Perez ahead. I still think Checo hasn't been seen on the TV world feed at all in a race in 2017, but he's devouring championship points with sheer gluttony (he's got three fewer than the top Red Bull indeed). Nico Hulkenberg and Carlos Sainz were solid and fast as usual - and got P6 and P7 respectively. While Sauber was sharp as a tack amid the flux, and Pascal Wehrlein got home in P7 on the road although it was converted to a P8 result due to a five second penalty for not staying to the right of the bollard at the pit entry when he stopped under the Virtual Safety Car (possibly due to a late call). Home hero Fernando Alonso couldn't however make good on his stunning qualifying effort. 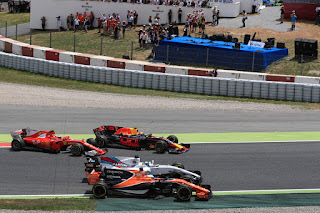 He was brusquely aided off the track by Felipe Massa at the second turn - not the first time the Brazilian has been a little sloppy when wheel-to-wheel - which consigned Nando to a day of frustration running in the pack with a Honda with which he couldn't do much to resolve the situation. He later got funky with strategy and indeed passed two Williams shortly before the end (presumably taking some measure of pleasure from vaulting Felipe) but it was only good enough for P12. At least though it was his first finish of the season. Ah yes, Williams. Which was hopeless. P13 and P16 with Massa ahead was its lot, though Massa at least had the partial excuse of a long stop with a puncture and apparent floor damage at the end of the first tour. Williams seems rather Force India in reverse. 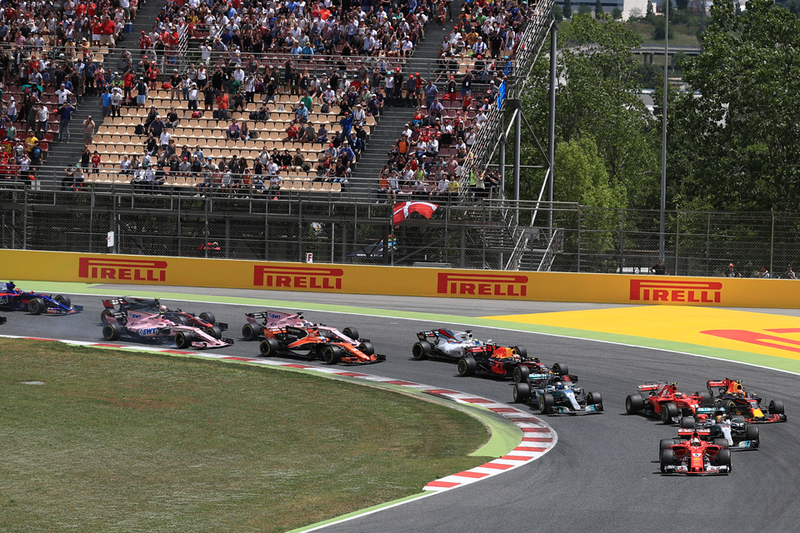 And perhaps the biggest take-out of all is that we got all of this at the Montmelo track, which as noted is long associated with soporific fare. Not even this place can alter the sport's charmed existence in 2017. Onwards and upwards.